There’s been a lot of non-gaming stuff going on in my life lately and I’ve taken a bit of a hiatus from play as much as I had in the past but it’s all been good. There’s been no major life-altering event or situation to awkwardly share. Just, well, life gets in the way of a hobby sometimes. On my last game night I had the opportunity (finally!) 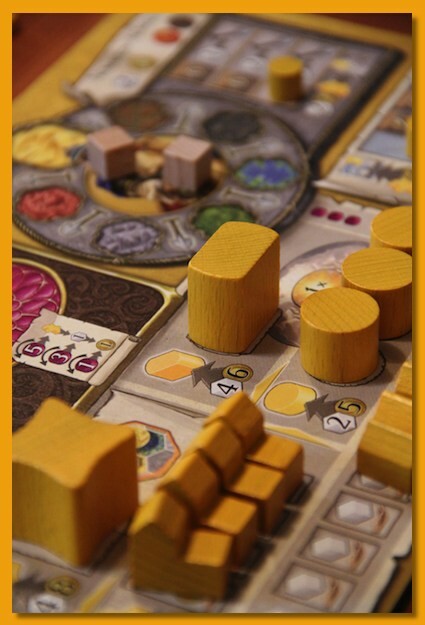 to play Terra Mystica. I’d ordered the game back in January and it finally came with copies of Lords of Waterdeep and Ginkgopolis. The Saturday before game night (always on a Monday) I tore open the box and started reading the rules and after about 30 minutes I started getting worried. With all of the lawn and garden work I had I wasn’t sure I was going to be ready to teach this monster. But after a few sample rounds on Sunday I figured, what the hell, I’m as ready as I’ll ever be. There were four of us and after setting up the game I got down to explaining the rules. I’d not practiced in any way so I winged it and hopefully didn’t screw up the ordering too badly. There’s an art to layering in the rules so that people can grok what’s going on without extreme overload but there’s just a lot to go over in the game. I think I should have described building Dwellings earlier but I think, overall, it went over well without too many questions. It was the only game we played that night so it took us a solid 3.5 – 4 hours including teaching so it’s a big boy, so to speak. I’m not usually one to like games of that length, however, I really enjoyed playing it and I couldn’t stop thinking about the game for the next couple of days. It’s gotten lots of hype and I think it lives up to it. I’ve got Ginkgopolis out on the dining room table now, running through a few “solo” games. Seems kind of neat but I’m starting to see there is some definite screwage of other players in the game and sometimes it’s not because you necessarily want to or need to but it’s just what you have to do. Not sure I like that in a game but I’m not passing judgement quite yet.